If you are like me, nothing says Easter like some sugar, sugar and more sugar. Ok I realize that isn't what Easter is about. But I sure do enjoy me some sugar anyway. And if your sugar looks as cute as this, you would enjoy it too! You start with your supplies: In this case Rebecca and I hunted a few stores for different options to make this fun. Did you know you can find graham crackers shaped like bunnies? 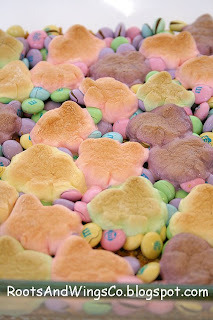 AND if that wasn't enough, there are bunny shaped marshmallows from KRAFT. Hello! Why did I not know about this before? 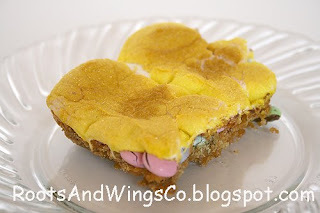 And of course, bunny Peeps and regular graham crackers were used in this too. 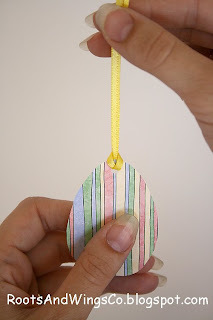 Let's start with the hanging tag. I cut a tag in the shape of an egg. The tag has the baking instructions typed up on it. Punch a hole in the top of the egg. 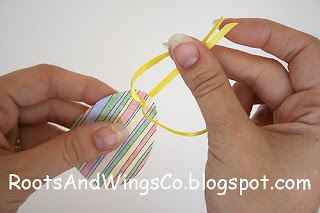 Fold over a length of ribbon and put both cut ends through the hole. Pull the ribbon through a little. Then draw the cut ends through the fold and pull. Very easy and a cute detail. Layer your ingredients in the jar. I find that the smaller ingredients end up at the bottom. If it is sugar or something like the crushed graham crackers, I like to put it in a baggie to go on top. I assembled this with the M&M's on bottom, then layered the bunny grahams, the bunny marshmallows and the bag of sugar on top. Add a little decorative trim to the lid and you are good to go. If you are going the Peeps route, I added the crushed graham crackers and the sugar in a baggie to go on top. I couldn't possibly just show you the gift in the jar. I wanted to make sure it would be something you would want to receive. I used to dislike gifts in a jar. But now, I LOVE them. They can be like having a boxed mix in your cupboard for those days when you need something quick. I love GIAJ!! And for you, dear followers, I wanted to make sure to bring you only yummy treats. I did half a pan of each jar. I did crush the graham crackers on the left side and add it to the sugar. And I love me some vanilla, so I added just a hair more than the recipe called for. I contemplated just eating it as it was. But no, I pressed on for your benefit. Ooh yummy goodness right from the oven. The Peeps did loose their faces. But look at their golden goodness. I can feel my thighs growing just from typing this up. Nothing but the best for my readers I tell you. And the marshmallow side was even cute. This was the only "slice" that made it nicely to a plate. This is a spoon and bowl kind of treat. The M&M's were all melty and gooey. 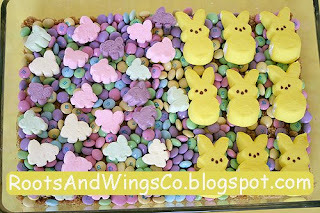 The Peeps side did have more crunch because of the sugar coated Peeps. But both sides were good enough to eat...several portions. Well not me, of course. Ok...you pulled my thighs arm...it was me. It was also Rebecca and my Mom that ate several helpings. I mean the kids were playing nicely in the other room. There is no need to interrupt that is there? Really, spoon, bowl, diaper wipes, yum. Don't eat the wipes. Use them to clean your face off before the kiddos come to see why you and your sister and Mom are being so quiet in the kitchen. 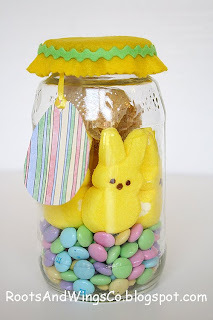 Layer those items in a 1 quart jar. 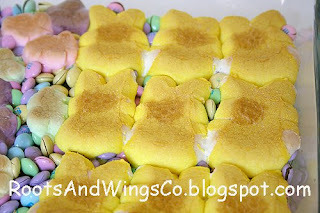 Put the crushed crackers and the sugar together in a baggie on top of the Peeps. The Peeps, marshmallows and bunny crackers I tried to face out so that you see their smiley faces. Much cuter than looking at their backsides. *When you are doing GIAJ I have found that sugars and crumbs go in a baggie, then layer by size, smallest ingredient first. 1. Empty the jar contents into a bowl. 2. Combine 1/2 cup melted butter and 1 tsp vanilla. Pour over the cracker crumbs and mix well. 3. Pat crumb mixture into a greased 9" square pan. 4. Layer the M&M's and then the marshmallows on top of that. I love it! Where is AZ are you? I love this... how cute! and yummy! I have smores ice cream in my freezer ... it's one of my favorites. These would make such cute teacher gifts! 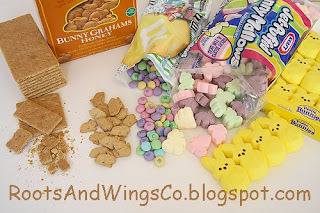 I saw this on your post on my friends Lorie's blog and she took it from my blog, I love the bunny mallows and crackers!!!! I am going to hunt for my bunny marshmallows!! Yum! Those look so yummy baked! Your blog has so many great ideas, I'm glad I found it! These look so yummy! I love the rick rac ribbon around the top of the jar,too! OMGOSH!! This looks awesome! My boyfriends 2 and 4 year old sisters will love this when I go see them for Easter. Thank you for making me the coolest almost sister-in-law around! This is so cute. And the end result looks tasty, too. :) Now I just have to make one of these for my nephew... and myself! I think this is an awesome teacher/neighbor/FRIEND gift. Hint, hint!!! I might have to treat my kids to this as a pre-Easter thing. FUN. These have got to be the cutest Easter gift idea I've seen yet. If I get the chance to visit someone this year I'll have to make a batch or two. SOOOOOOOOOOOOOOO cute! Thanks for this great idea. Such a great Idea, so pretty :) I think if you wanted to do it like this .